This week’s FOMC meeting marked Janet Yellen’s final meeting as Chairwoman of the Federal Reserve. The US 10 year has already broken the trend line above. Fed policy, strong global growth and the new kid on the block, US fiscal policy have driven the latest round of selling. Pick up our latest Bear Traps Report for our detailed investment thesis of 2018. No rate hike was expected at this week’s meeting, and none came, leaving the midpoint target level at 1.375%. The next 25bp increase – up to 1.50%-1.75% from 1.25%-1.5% – will come, in all likelihood, at the March meeting with Chairman-elect Jerome Powell at the helm. 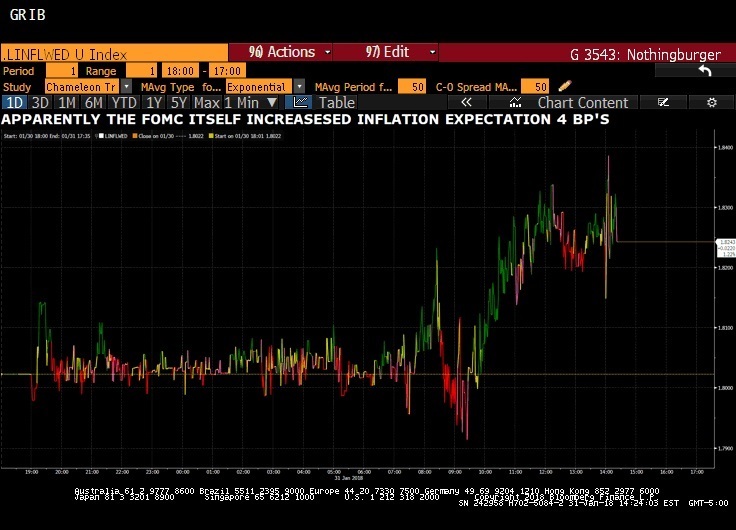 The big news of the day (see above) came when the Fed raised near-term inflation outlook to above two percent, driving the two-year bond yield even higher, while the long end (30s) rallied, thus more flattening. 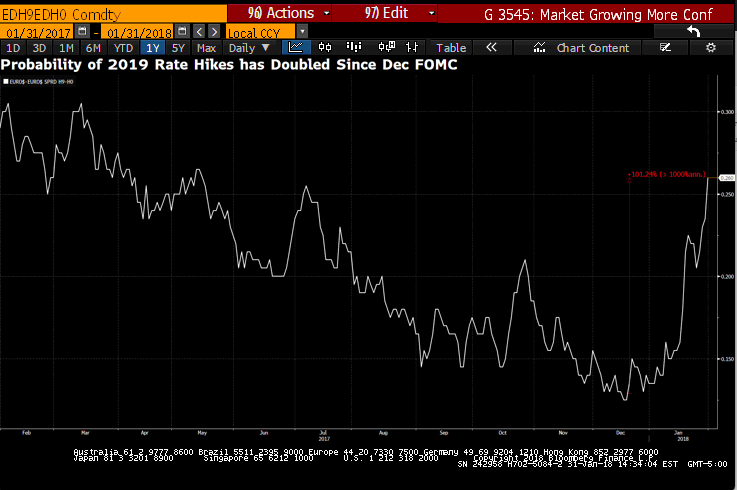 The thing to keep your eye on, in our opinion, is the probability of four hikes in 2018, instead of the three (the recent consensus). The Street was hawkish today before the meeting. Much of the debate comes from the Fed’s word choice on near-term risks to the economic outlook. The Fed reiterates these risks as “roughly balanced,” a nod away from Goldman Sachs’ expectations that these risks would now be just “balanced”. Chair Yellen left today as dovish as she came, and the Street is looking at the Powell team as by definition, more hawkish (more likely to pull back accommodation). Data-dependent, gradual raising Yellen hands the baton today over to a similarly data-dependent Powell. However, if the data (recently firming prices and slightly higher, yet still sub-2%, PCE) is allowed to speak for itself, it was reasonable to expect a hawkish tone in today’s statement. Today’s Chicago PMI printed 65.7, soundly beating the consensus estimate of 64, yet lower than the unsustainable prior-revised 67.8. Upcoming significant data releases include Jobless Claims and Nonfarm Payrolls, on Thursday and Friday respectively. Yellen, while ill-advised to act based on market prices has a history of mentioning “rich asset valuations”, and must be keeping her eye on the technically-overbought S&P 500, which, even with this week’s move off the highs, is up 5% YTD, or an annualized rate of 83%. NY Fed President Dudley recently expressed concern about the possibility of an “overheating” economy that appears to be stretching its cycle after the passage of tax reform. The 2.6 percent headline rate doesn’t do justice to fourth-quarter GDP where consumer spending rose a very strong 3.8 percent that reflects a 14.2 percent burst in durable spending. Bloomberg noted Residential investment, which is another consumer-related component, rose at a very impressive 11.6 percent annualized rate. Turning to business spending, nonresidential fixed investment rose at a 6.8 percent rate which is the fourth straight mid-single digit result. What does this mean for bonds? We have an important note coming out, pick it up here. Government purchases at a 3.0 percent rate, also added to GDP in the quarter. What pulled down fourth-quarter GDP were net exports, at an annualized deficit of $652.6 billion, and inventories which rose at a slower rate than the third quarter. Looking at final sales to domestic buyers, which excludes inventories and exports, GDP comes in at a robust 4.3 percent. Prices also showed some vigor in the quarter, with the index at 2.4 percent vs the third quarter’s 2.1 percent. This is a standout report led by the consumer that shows the economy accelerated into year-end 2017 with strong momentum going into 2018. There are both positive and negative views that can be extrapolated from today’s data. The consumer savings rate fell to its lowest since November 2007, down from 3.3% to 2.6%. If it had stayed the same, Real PCE would have been 0.8% (annualized) instead of 3.8% and GDP would have been 0.6% instead of 2.6%. Clearly, business and consumer confidence levels are nearly 2 standard deviations higher than the 1010-16 mean, thus spenders seem to be more confident dipping into savings with visions of better times ahead. The GDP came in lower than expectations, but net of hurricane-impacted inventories and exports, 4.3% is an objectively impressive number. This adjusted 4.3% rate isn’t unprecedented growth, however, even in recent memory. We saw 3% YoY in first half 2015. So, then, how sustainable is the growth? In the short term, a decreasing savings rate will boost demand. The near-term outlook is bond bearish, and it should be. Prices are rallying, savings are down, and over the next quarter or two we should see some legs on consumer demand; something that has been notably weak in recent memory. There is a reason to be optimistic into early 2018 from a consumer spending perspective, and perhaps even beyond, depending on the timeline for infrastructure spending. Economic activity built on a foundation of lower savings, in the absence of wage growth, will eventually drag output lower. Lower consumer savings is likely overstated; we regularly see upward revisions. Cycle-low savings rates don’t stay low forever. Companies have shown a resilient hesitation toward raising wages. Americans are borrowing to finance their own spending and with any reasonable stall in consumer spending into 2018, our current annualized growth rate will be under significant pressure.